Do you love the combination of chocolate and peanut butter like I do? 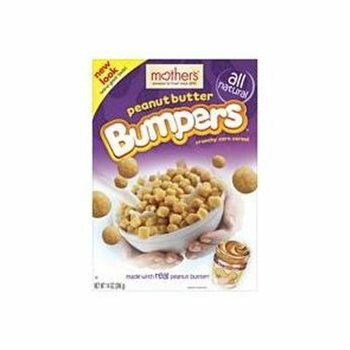 If you’re looking for a healthy alternative to sugared cereal, try Mother’s Natural Bumpers crunchy corn cereal by the Quaker Oats Company. It’s all natural, and only sweetened with molasses and honey. Both kids and adults love Bumpers! ingredients: CORN FLOUR, UNSULPHURED MOLASSES, NATURAL PEANUT BUTTER (GROUND PEANUTS, SALT), OAT FLOUR, RICE FLOUR, HONEY, SALT, NATURAL MIXED TOCOPHEROLS (VITAMIN E). ingredients: CORN FLOUR, UNSULPHURED MOLASSES, HONEY, OAT FLOUR, CARAMEL COLOR, SALT, COCOA, NATURAL FLAVOR, NATURAL MIXED TOCOPHEROLS (VITAMIN E). For a 1 cup (33 g) serving of Peanut Butter Bumpers, there are 130 calories, 3 g protein, 2.5 grams total fat, and 26 g total carbs. The Mother’s brand cereal is found in the health food section of our grocery store. These are delicious and crunchy. 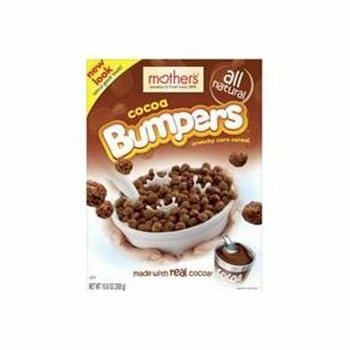 Try mixing the PB & choc bumpers with skim milk or plain rice or almond milk. It’s like dessert!